Stephanie Banner is twenty years old the night Dakota Shane stands center stage while six bullets ring out through the stadium. Five deaths occur from those shots, although only four ever go on record. It happens in Portland, Oregon, at the Rose Garden Arena. The show is a sellout. Twenty-two thousand seats went in less than four hours. And then, Dakota Shane: a chart-topping superstar with a dark secret, caught in a media and tabloid frenzy full of rumor, speculation, and lies. She’s off her meds and grappling to find any semblance of herself that might still exist inside an identity forged over the past five years by an extremely successful record company’s marketing department. Each of these lives is a story and the stories collide with each other like silver balls bouncing off bumpers on a pinball machine. But in the end, The Rose Garden Arena Incident is a tale about passion, about bravery, about redemption, about fixing those things in the world that are fixable and learning to live with the things that are not—A heartbreaking story of tragedy, despair, and loss that still somehow leaves you with a glimmer of faith, love, and hope. 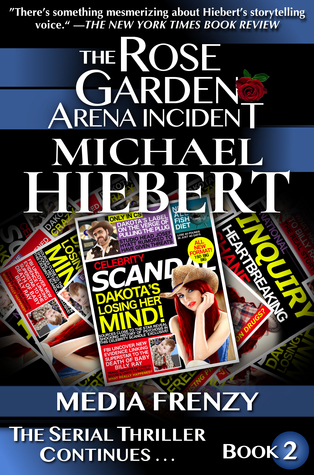 The Rose Garden Arena Incident is a “serial thriller.” The story takes place over seven separate books, each encompassing a full day or more leading up to the Dakota Shane concert. What a great 2nd book!! From the first chapter, I was drawn into the individual lives of the characters. Can’t wait for the next book to come out!!! Picking up the next day from Mosh Pit (review here), you are taken through a day in the lives of Marshall Davis, his Aunt Fanny, Uncle Joe, Karma Ackerman, Stephanie, Brenda, Alexis, and her band, Reggie and of course Dakota Shane and her people. I really felt bad for Marshall. He is suffering so much guilt over the deaths of his younger sister and mother. All that was told was that they died in a drive-by shooting. Why he is blaming himself, is still unknown to the readers right now (remember this is a serial novel). So a visit from Reggie, the man who basically saved Marshall afterward, is much-anticipated. To the point where his Uncle Joe, who I really couldn’t get a feel for, got them courtside tickets to the Trailblazers. Now, Reggie is in a heap of trouble. He was drinking and driving recklessly which resulted in him crashing his car in the desert. He gets himself out of the wreckage and walks to the nearest rest stop where he meets up with some people that he knew in Saint Louis. Karma wakes up from her night out, hung over and questioning if she really should be out partying all night with Stephanie and Brenda. But, she accepts an invite from Stephanie to go to a club to see The Posey Dolls play. Her decision to stop drinking lasts until she gets into the car with Stephanie and Brenda and they share a bottle of vodka. She learns something really surprising about Brenda and then goes and does something really stupid. Well, I think she does something stupid because she didn’t even know what she did. Alexis and her band, The Posey Dolls are setting up to play at The Smilin’ Ghandi Cafe. The band is at odds with each other over anything. To be honest, I wanted to smack Cindy. She was being such a witch to Alexis about a recording they did a few weeks back and haven’t heard back from the agent. The other band members, Fiona and Namika, arrive and they continue to set it up. The tension between Alexis and Cindy come to a head…with surprising results. Dakota Shane’s tour bus rolls into the Hotel Casablanca in Salt Lake City, Utah. She is a mess, convinced that she has a stalker and the stalker killed her 14-month-old son, Billy Ray. Her road manager, Tommy, is under a lot of pressure from her agent, the Admiral, to keep her at least partly sane until her tour is over. Unfortunately, Tommy has to break news to Dakota that could very well push her over the edge. The book ends with all of these storylines up in the air plus all of the other ones from the first book. But it ends in such a way, teasers from the next book, that I have to read the next one. I am hooked!! Why: A great second book. You can’t help but care even more for the characters.